Printers must be set up in Windows and able to print a “Test Page” before the POS software can print to it. Until the terminal can print a Windows Test Page, you shouldn't try to configure the printers in the POS software. If you're in a Terminal Services environment, the printer must be set up in the terminal session for the Windows user connecting and you must be able to print a Windows Test Page. You must add the printer, you can't use "session" or "redirected" printers for POS. We do not assist with setting up POS printers in Windows. This is the responsibility of the customer or their hardware technician. If assistance is needed, they should contact the manufacturer of the printer. You must follow these instructions for Point of Sale printing to work properly. $$ - Where a printer is defined for each terminal. Use this method if the printer names vary between terminals. The printer setup has to be performed at each terminal. This is the method that must be used with our Cloud Hosting service. // - Where a printer is defined for all terminals. Use this method if the printer names are the same between terminals. For example, you named each terminals' receipt printer "Receipt," or the kitchen printer has the same UNC from all terminals. The printer setup only has to be performed at a single terminal and it will apply to all terminals. 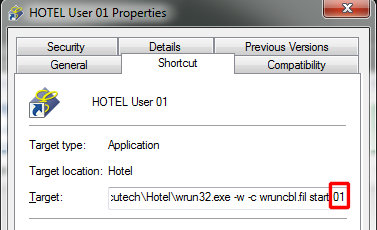 WIN-DEFAULT - Where a terminal's Windows default printer is used. Printer names can cause a lot of confusion for the end user if they find themselves needing to select printers in the software. Do not use system device names like COM1, LPT1, USB001, etc. Name your printers something simple and obvious, like Receipt or KitchenHot. A name like KT-2554 might mean something to the network technician but it means nothing to a part time bartender who finds themselves needing to redirect a failed printer. You’ll know which computer the printer belongs to when you see the UNC. Everything in this document is important. Read it again if something isn’t working. If you change Windows printer names after configuring the printers, printing will stop working properly. You will have to reselect the printers in our software if this happens. EACH DEVICE NAME IN OUR PRINTER SETUP MENU MUST BE UNIQUE! You can’t use $$Receipt on more than one line. Use $$Receipt1, $$Receipt2, etc. Do not use system device names like COM1, LPT1, USB001, etc. It helps to give printers short and obvious names like “RECEIPT”, and “KITCHEN”. Printers must be set up in Windows and able to print a “Test Page” before the POS software can print to it. THIS IS VERY IMPORTANT. OUR SOFTWARE CAN'T PRINT IF WINDOWS CAN'T PRINT. Printers in Remote Desktop Services. Don’t use “session” or “redirected” printers. These are auto generated printers and not suited to an environment needing static printer direction. If you use these printers your receipts and kitchen chits may print to locations other than the specified printer. Each printer must be set up on the server, in the current user’s session. If 10 users need to print to a printer, then the printer will need to be shared to all 10 user’s sessions. Basically, you’re reversing the typical print server role. Instead of the server hosting the printer, the printer will be hosted on the client and shared to the server. In our printer setup, we provide a button, “Printer Control Panel,” that brings up your Windows printer setup and allows you to add and remove printers when you’re environment locks you into our application, provided your user has the appropriate permissions. Cloud Hosting customers WILL be using "Redirected" printers. The warning found above DOES NOT APPLY TO YOU. When possible, use the manufacturer's printer driver. However, if you're using a version of the software older than July 10, 2012, you must use “Generic / Text Only” printer driver if you choose the $$ printing method. Because many USB printers don’t work with the “Generic / Text Only” printer driver, versions of our Execu/Touch software prior to v. 2012.07.10 may not be able to use the “$$” method of printing for these printers. You should use the “//” method or use "WIN-DEFAULT" instead. If you're software doesn't support "//" or "WIN-DEFAULT" it's very old and you will need an update. A POS terminal’s receipt printer should be set as the Windows Default Printer for that terminal. When setting up and configuring printers, sometimes it’s easier to perform each step at one terminal at a time. This way you’ll see the entire process from start to finish before going on to the next terminal. At each terminal that needs to print, be sure that each printer it needs to print to is set up and working in Windows. Verify this by printing a “Test Page”. Try to give each specific printer the same Windows name at each terminal. If you have two kitchen printers, name them something like “KIT1” and “KIT2”, or “KIT-HOT” and “KIT-COLD” and use these names when setting up the printers at each terminal. Go to the POS Administrator Menu and click on Printer Set-up. Go to the line of the unit number you’re setting up. The unit number is defined by either the terminal’s receipt printer setting or the menu item’s remote printer setting. The printer must be selected at each terminal. The device name must begin with “$$”. For consistency, we recommend using the printer name as the device name. For example, printer “KIT-HOT” would have a device name of “$$KIT-HOT”. // Printing (Good for shared remote printers) The printer should only be selected once and the Windows printer name must be accessible by all terminals. The device name must begin with “//”. For consistency, we recommend using the printer name as the device name. For example, printer “KIT-HOT” would have a device name of “//KIT-HOT”. This will cause each terminal to print to its own default Windows printer. If your software version shows the "Windows printer name" column, click the cell for this printer. Otherwise, click in the "Device" cell and press the ENTER key until the Printer Setup box appears, usually one or two times. Select the printer from the list. DO NOT click Network and select from that list. *The printer seen in the "Name" field IS NOT the currently set printer. It just shows you the last printer selected in Windows and not the printer currently set in POS. Do not look at this and think that your selected printer has changed. The printer seen in the "Windows printer name" field is the printer that is currently set. You will be asked to verify your intent to change the printer. Click “Yes” if this is what you want to do and you’re finished. If your printer is already configured, you can simply click the printer name under the “Windows Printer Name” column to select the printer. Differences in “$$” and “//” printing. $$ Using this prefix allows each terminal to define its own physical printer. The Unit 1 device can be defined simply as "$$RECEIPT. From each terminal, you can set Unit 1 as the receipt printer and select its specific printer. This has to be done at each terminal. This would allow terminals 1, 2, 3, etc. to all use Unit 1 as its receipt printer while Unit 1 is defined as a unique physical printer in the POS Printer Set Up. // Using this prefix allows you to define a physical printer that applies to all terminals. This is great when setting up kitchen and bar remote printers. The Unit 11 device can be defined as "//KIT-HOT", or your hot kitchen printer. You set Unit 11 to be a remote printer for all applicable menu items. From any terminal, you can set Unit 11 as the shared remote printer. This only has to be once, from any terminal. This method can also work for local printers. If you have 3 terminals, each with a local receipt printer in Windows named "RECEIPT", you can set Unit1 device to "//RECEIPT" then select the receipt printer at one terminal. This setting will apply to all terminals but will only work if the terminal has a printer in Windows named "RECEIPT". Because “//” printing applies the printer settings to all terminals, each terminal must see the printer with the same name or UNC for it to work. If this is attached to a computer that also needs to print to it, you may need to use $$ printing because the computer to which it is physically attached might not be able to see it as "computer\printer". Call support for assistance if you have any questions about this. Nine characters max. The first lists the unit number to be referenced in the Terminal Record and in the Item record for remote printing. A five character description you create to help identify the printer in the list. Y to send a hardware form feed if you are using a laser or ink jet printer. N to not send a form feed. 2, 3, etc., will print that number of guest receipts. C will cause the guest receipt printer to cut after it prints. 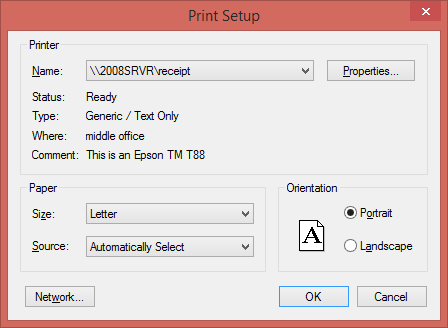 If you are using a thermal printer for remote printing and need to print 2 copies, cut, type 2 in this field. This sorts (lists them together) items to the kitchen printer. Y sorts items and departments, N sorts just departments, and X will send the items just as they appear on the screen. Set Sort Kit to X . Assign a Seat Number to each item on the order entry screen. Y causes the kitchen printer to cut between departments. N will not cut. 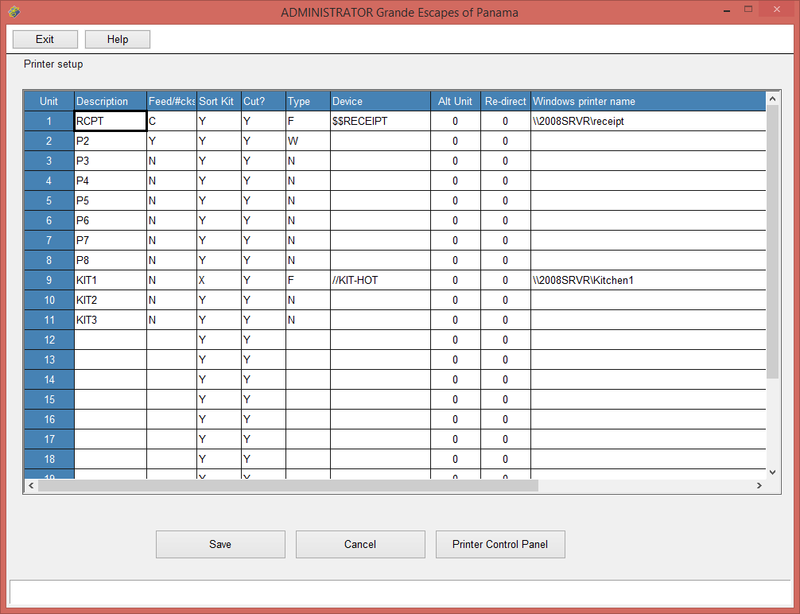 This is where you select the type (Brand / Model) of the printer or its emulation. This is vital to functions like bold print, colored print, cutting, etc. Right click to select from a menu of compatible types. Keep in mind your printer may support “ESC/POS or Epson Mode”. If this is the case, select the appropriate Epson type, either “E” for all impact or “F” for all thermal. 12 characters max. Do not use system device names like COM1, LPT1, USB001, etc. This is where you specify $$ or // or use WIN-DEFAULT. This is where you reference a printer that will receive the remote print job if this printer fails to print. You will enter the Unit number of the other printer. This allows you to temporarily redirect remote printing to another printer for all terminals. You will enter the Unit number of the other printer. This shows the currently selected Windows Printer. You can click this field to change the printer. Knowing which printer you’re setting up is very important. If you set up the wrong printer you can mess up existing terminal and working printer configurations. Please take the time to read this and be sure you know what you’re doing. First, you need to identify your terminal number. There are three methods of doing this, the first requiring a small amount of Windows knowledge, which we cannot provide you. The last two methods may not work if you’re on a version of the software more than three years old. Right click on your shortcut (this is the icon you use to run the software) and select Properties. You’re looking for a text field titled Target. At the end of text in that field, you’ll see a two digit number – this is your terminal number. This is the login where you are presented with two fields titled Enter your I.D: and Password:. After logging in, look to the bottom left of the window for your terminal number. This is the login where you are presented with an onscreen keyboard. Look to the bottom left for your terminal number. Now that you’ve identified your terminal number, you need to identify the receipt printer assigned to this terminal. Go to your POS Administrator and then to Terminal Setup. Enter in your terminal number and you’ll see the printer assigned to this terminal. This is a number, 1 - 24, that identifies which 'Unit" in the printer setup is used. There is nothing to do for credit card receipt printing in Point of Sale. The credit cards will print to the receipt printer that's defined for the terminal. 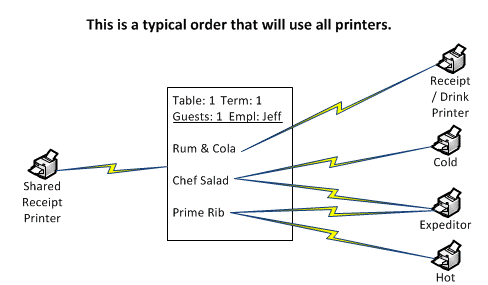 This image shows you the typical layout of POS printers in a restaurant or bar. This is only a guide to assist in understanding how printers interact with the terminals and software. Because Terminals 1 and 2 are close they can share a single receipt printer. The Printer at terminal 3 will serve 2 duties. First, as the receipt printer for terminal 3, but also as the Food items from Terminal 1, 2, and 3 will print to the appropriate kitchen printers and drink items will print to the bar's drink print printer. Often there's an expeditor printer where the servers pick up the plates. This printer prints all food items, not just hot or cold items. This helps the server or expeditor determine if the orders are complete and ready.